Instructions in both German and English. ….has it been prophesied to me: “I should manage my time better”, “less is more”, “you can do it all”, “don’t be too extreme”, “on a Thursday, you will meet a famous celebrity,” “you’ve got loose ends” and “everything will be fine”. How it all fits together is still quite puzzling to me, but a grain of truth is somewhere in there and it’s difficult to change your nature. Since then, I’ve been drinking less tea. The swirling, fortune-telltale tea leaves make me nervous. 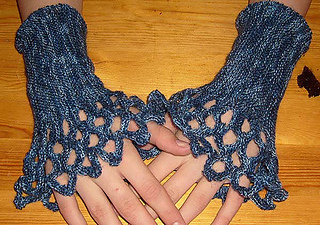 These fingerless mittens can be worn normally with the created thumb gusset and the holes hanging over the wrists or used as wristwarmers and worn upside down, with the holes hanging over the fingers. 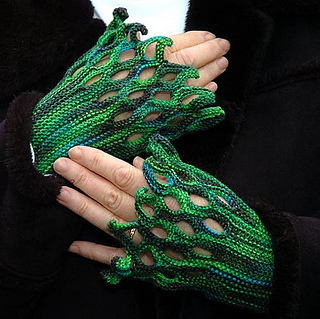 You don’t even have to knit a thumb gusset for this version.